The best thing you’ll read this week—and the most revealing look at the dynamics of the men who actually run the NFL I’ve read in years—is this ESPN The Magazine feature by Seth Wickersham and Don Van Natta Jr., a tick-tock of the gossip, the cajoling, the backroom deals, the conniving, and finally the vote that got Rams owner Stan Kroenke his Los Angeles stadium. Despite the often conflicting rumors that spread throughout the process, the story here is as simple as they come: a rift between the NFL’s old money and new money, with the battle lines clearly drawn. On one side, a Carson stadium for the Chargers, backed by the NFL’s old guard of owners led by Jerry Richardson, and including Bob Kraft, the Rooneys, the Maras, the Hunts. On the other, the Rams’ Inglewood proposal, championed by Jerry Jones, along with the likes of Dan Snyder, and Jeff Lurie. Knowing how it ultimately went down, we might one day look back at this as the NFL’s changing of the guard. Roger Goodell, we’re told here, privately preferred Inglewood—but wanted to and successfully did stay neutral on the matter. Complicating things was that the owners all like Chargers owner Dean Spanos, one of the league’s staunchest lieutenants. “Loyal to a fault,” one friend puts it here. When the stadium negotiations started to kick into gear, most assumed that Spanos would command enough support to get his way. Owners felt no such bonhomie for Kroenke, a cold, distant businessman to the core. Then Jerry Jones reminded everyone that this is business, after all. Jones pops up again and again in this narrative, the loudest voice for Inglewood and seemingly the prime mover at all times. When relocation talks appeared to stall in late 2014, and the NFL set them on the back burner, it was Jones that urged Kroenke to build his stadium without waiting for the league. Kroenke unveiled his plans the next month. When the two sides formally presented their proposals in Aug. 2015, it was Jones who dominated the room. When the Carson proposal brought in Disney CEO Bob Iger, who was supposed to provide the star power and “wow factor” that the Chargers’ plan was perceived to lack, it was Jones who cut his feet right out from under him. On behalf of Carson, Iger went next. He tried to “break the ice,” he says now, with a joke about how in his 42 years at ABC and Disney, he had paid more money to the NFL than anyone else. The quip was met with blank stares. For about 20 minutes, Iger spoke with a slideshow behind him, then ended with another prepared line, a spin-off of the famous commercial of the Super Bowl MVP shouting, “I’m going to Disney World!” “I hope I’m going to the NFL!” Iger said. Again, silence. But more important than anything else, Jones provided the blueprint for the deal that ultimately ended up getting passed: it was Jones’s idea for the Chargers to abandon the Raiders, and move to L.A. with the Rams. He convinced Kroenke to accept a partner or tenant, something the Rams owner had previously resisted, because Jones knew it was the only way to get enough votes to move at all. Despite most observers expecting Carson to carry the day at the formal vote, a version of Jones’s proposal, with the Rams in Inglewood and the Chargers given an option to join them, earned 21 of 32 votes. 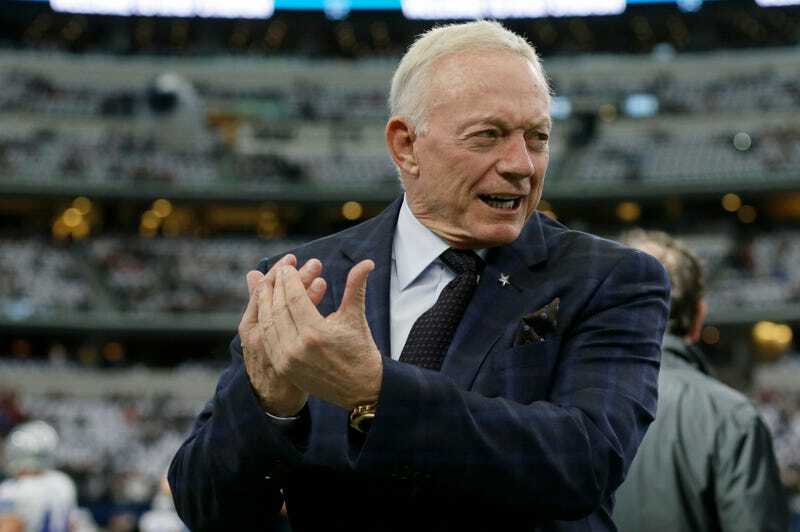 There’s a sense around the league that Jerry Jones doesn’t have his hands in the Cowboys as much as he used to, that a combination of age and good sense have seen him cede a lot of control to his son Stephen. That Jones’s most influential days, at least with his own team, are behind him. That’s not the Jones that’s described here. This one, tirelessly working the phones to whip up support for his side, celebrating with whisky and steak when he won, this is Jerry Jones in his prime. When it’s all said and done, Los Angeles might be his single greatest NFL legacy.